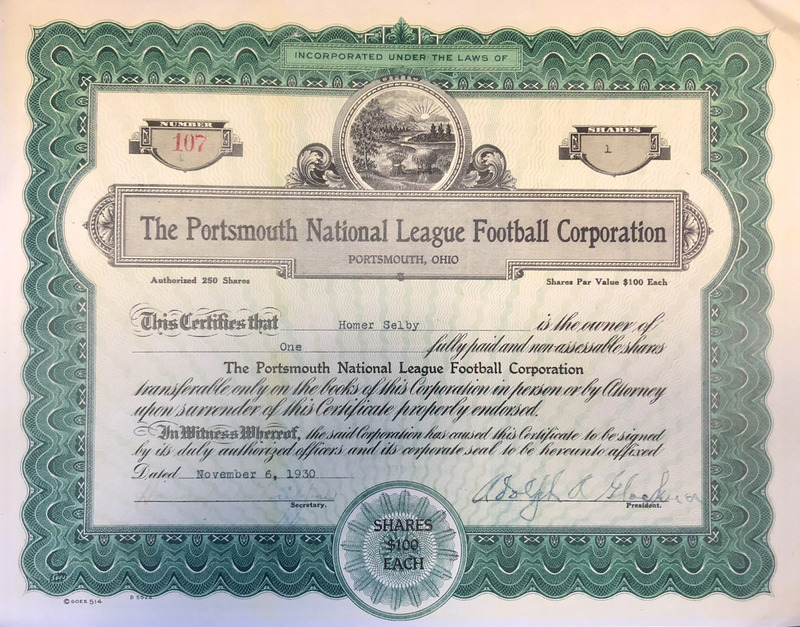 Signed by Adolph Glockner, President of the Portsmouth National League Football Corporation (the NFL Spartans), this stock certificate for one share was originally purchased by Homer Selby for $100 in November 1930. Selby's investment represented the support of the Portsmouth Shoe Industry, in general, and Selby Shoes, in particular. Selby would be elected president of the corporation in 1932. Other prominent stockholders included Harry Doerr, Portsmouth Postmaster; Hugh Allen with the Wheeling Steel Corporation; C. E. Nedler with First National City Bank; Col. A. L. Mercer with the Vulcan Corporation; and Harry Snyder of the Universal Construction Company, who was the largest investor in the franchise.